Fueled by his restored faith in humanity and inspired by Superman’s selfless act, Bruce Wayne enlists newfound ally Diana Prince to face an even greater threat. Together, Batman and Wonder Woman work quickly to recruit a team to stand against this newly awakened enemy. 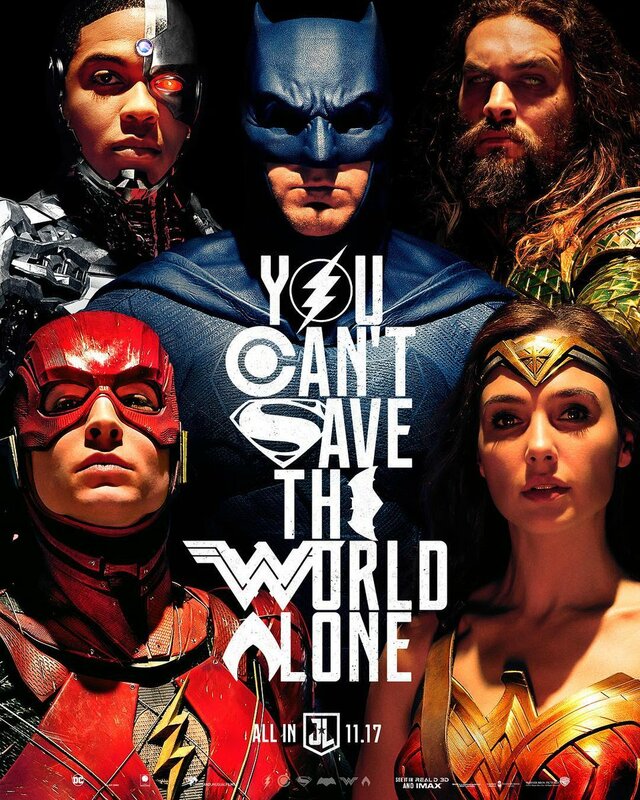 Despite the formation of an unprecedented league of heroes – Batman, Wonder Woman, Aquaman, Cyborg and the Flash – it may be too late to save the planet from an assault of catastrophic proportions. Thank you for making this. I wanted to, but didn’t feel like it. This film has all of the makings to be an epic! I have high hopes for it! What I do love the most is what Zack Snyder has done with Batman, with the help of Affleck. Not since the days of Burton have we had a Batman so true to the comics as it relates to overall aesthetic. I’m very scared for this movie. After hearing that it was 170 minutes I was pretty okay with it, but 120 minutes? Good lord. They’re gonna be craming a lot of things in there and the whole thing could feel super rushed. Now, there’s a huge possiblity that I’m gonna eat my words and I can accept that, but as of right now - I’m very skeptical and scared. Especially because Wonder Woman was absolutely incredible. I am so excited for this, I have high hopes for this one. So far the reviews are torn apart, some say it is good but not on the level o Wonder Woman. It was good. Not great, but better than I expected. The music was great (both score and soundtrack). The action scenes were extremely good (too much cgi for my taste, but hey, it’s 2017 and most movies have plenty of cgi scenes). As for the acting… It was ok, but in their defense, the movie focused more on action scenes, and, more important, the eye candy factor ( ). BTW, I love going to the matinee shows, just for the fact that there is less people (sometimes I’m the only one there) and I think I can enjoy the movies better. Hoping to check it out today! I watched this last night, it was really good ! got me shook because Superman V Batman was sort of okay (I loved Wonder Woman though). The acting was really great, everyone did a great job. The action scenes were on point very enjoyable. The story as a whole was great and really showcased a true adaption of the comics and I felt like I was hooked the whole film and didn’t look away. THE ONLY COMPLAIN though is the villain Steppenwolf design, it looked a bit rubbery (Zack Snyder style ) and they could’ve spent more time designing it and making it look more realistic. Oh man, this was messy. I did like the overall acting, the team worked good together, but I’ve rarely seen such a boring story. Even for Superhero-movie standards it was weak. Ben Affleck is stiff and feels uncomfortable as ever, like he didn’t even wanna be there. He really brings down the whole movie and if the DCEU will continue (which I’m not sure of), I really hope for Jake Gyllenhaal to take the role. I went in with less than zero expectations, after the garbage fires of BvS and Suicide Squad, but I have to say I was pleasantly surprised. I loved the lighter tone it had (Thanks Whedon!) and I really liked Ezra as Barry. Still not as good as Grant on TV but good nonetheless. Jason was okay, Ray was forgettable, and Gal was incredible as always. I loved the scenes with Lois and Martha. Amy and Diane do a great job with those characters. I loved seeing the Amazons, I liked seeing Mera, and I ABSOLUTELY loved the part where Clark was going after Barry during the slo-mo running part. Seeing Clark just destroy the League was amazing. The villain was okay, the two after credit scenes were eh, but overall there were no real plotholes and all around it was a good movie.